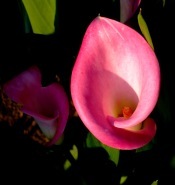 Pink Calla Lily has become favorite house plant, and it's easy to see why! Its charming, funnel-shaped blooms may be pink, rose, lavender or violet. It is a smaller plant (growing up to 16 in/40 cm) than the white or yellow varieties ... and I think much more attractive. Those long, tapered leaves are deep green, often with faint white spots. They fall under the category of "tender bulbs" because they can't tolerate freezing temperatures. But that makes callas easy to please indoors. 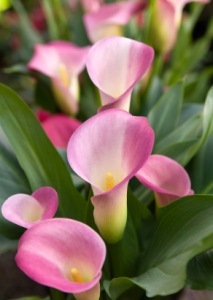 You'll find these petite pink callas for sale in nurseries and online flower delivery sites in late winter, spring and summer. You can now buy lilies in florist's shops around the holidays, too. The secret to keeping its blossoms fresh for several weeks is to keep the plant warm and well-watered. Soooo...you've purchased your Zantedeschia rhizomes and they're still in the bag. Wondering what to do next? Relax. They're easy to grow. Just keep them warm and moist and you should see those colorful calla blooms in about 8 weeks. Pot the rhizomes in a 6- or 8-inch pot, covering with 1 inch (2.5 cm) of soil. Water thoroughly and empty drainage tray. Set your potted bulbs in a warm, sunny window. These colorful callas won't bloom unless the temperature is 70°F/21°C or higher, even at night. Fertilize only while plant is growing and flowering. Flowers are triggered by a cool, dry dormancy for at least 2 months. With this rest, you can force your callas to rebloom for 3-5 seasons. When rhizomes stop producing a good show of flowers, it's time to replace them. 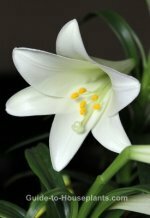 When flowers die, allow the plant to go dormant by gradually reducing the water. Wait till the foliage turns yellow and withered, then cut it back. Leave the rhizomes in the pot and store them in a cool (40-60°F/4-16°C), dark place giving it just enough water to prevent the rhizomes from drying out completely. Dormant rhizomes can be restarted in January to March. Pot them in 6 in (10 cm) pots with fresh soil. Top with about 1 inch of soil to cover the rhizome. Put the plant back in a warm, bright spot (out of direct sun) and keep the soil moist. Blooms should appear in about 8 weeks. CAUTION: All parts of these lilies are poisonous; the rhizome is the most toxic. Keep it out of the reach of children and pets who may play with or ingest this plant. Water: After potting pink calla lily rhizomes, keep the potting mix lightly moist. Increase water when plant is growing and blooming. Temperature: Warm (70-85°F/21-29°C) while growing and flowering. Soil: Peat moss based potting mix that drains well. Fertilizer: Feed every 2 weeks with a high-phosphorus liquid fertilizer diluted by half while plant is growing. Propagation: Rhizomes. See how-tos above for planting rhizomes. Zebra Plant is a Brazilian native with exotic, emerald green leaves with dramatic white veins. Find out what light, water, humidity it wants and when to repot.